Wild Rice Chowder looks complicated, but once you start cooking it's just a matter of adding ingredients as the soup cooks. Try serving it with Onion Scones fresh out of the oven. Drizzle it with some basil pesto for even more flavor. This hearty soup can also be made ahead of time. Just make it as the recipe directs, then refrigerate it up to 3 days. To serve, just reheat in a saucepan over low heat, stirring frequently, until the soup simmers. 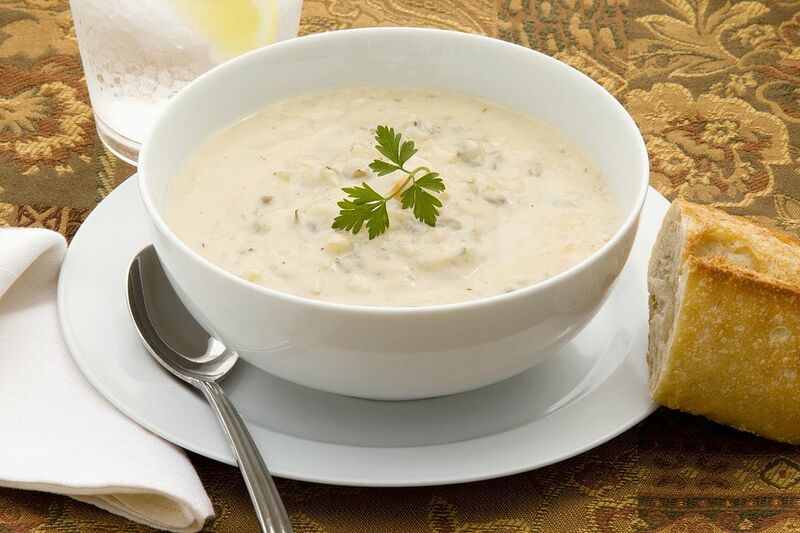 You may need to add some more chicken broth or half and half to get to the desired consistency if you are reheating the chowder. In a heavy saucepan, combine the wild rice and water. Cover and bring to a boil. Lower the heat and simmer for 30 to 45 minutes, or until the rice is tender. Do not drain. Set the rice aside. In a large stockpot, melt the butter or heat the olive oil. Add the onions and garlic and saute until tender. Add the flour and cook, stirring constantly, for 1 to 2 minutes or until the flour mixture bubbles. Stir in the chicken broth and mix well with a wire whisk until the sauce is blended. Add the potatoes, carrots, thyme, nutmeg, and pepper. Cover the pot, bring the soup to a boil, reduce the heat to low and simmer for 20 to 30 minutes or until slightly thickened. Add the corn, then cover and simmer an additional 20 minutes until the vegetables are tender. Stir in the half and half, ham and the cooked wild rice. Cook until steaming, but do not bring the soup to a boil again. To make the soup in the crockpot, combine all ingredients except olive oil (which is omitted), flour, half and half and corn in a 4-quart crockpot. Cover and cook on low for 8 to 9 hours. In a small bowl combine 1 cup half and half and 2 tablespoons cornstarch and mix well. Stir into the crockpot along with remaining half and half and corn. Cover and cook on high for 30 to 45 minutes or until soup is thickened and ham is hot.